Kevin Nugent | This site features news about Dr. Kevin Nugent, author of Your Baby is Speaking to You and Director of the Brazelton Institute at Boston Children's Hospital. This site features news about Professor J. Kevin Nugent, Director of the Brazelton Institute, the Division of Developmental Medicine, Boston Children’s Hospital and Professor Emeritus, the University of Massachusetts and Lecturer, Harvard Medical School. Dr. Nugent and his colleagues, Drs. Keefer, Minear, Johnson and Blanchard, developed the Newborn Behavioral Observations (NBO) system, which is being used in clinical settings across the world. He is the author of many books and scientific articles on newborn behavior and parent-child relationships and is co-author with Dr. Brazelton of the Neonatal Behavioral Assessment Scale (NBAS). (Click below to view a short introductory video on the history of the NBAS featuring Berry Brazelton and Kevin Nugent). He is also the author of Your Baby is Speaking to You, the highly acclaimed, top-ten bestselling book for parents. Read more about Kevin’s recent lectures in Helsinki, London (the House of Lords), Shanghai, Hong Kong, Tokyo, Nagoya, Rome, Prague, Lisbon, Galway and Dublin (the Oireachtas). News about the Master Lecture he delivered at the World Association for Infant Mental Health Congress in Prague in June 2016 and the NBO training he and colleague Professor Campbell Paul, Royal Women’a Hospital, Melbourne, presented in Hong Kong and in Toyko and Nagoya in Japan September last are also described. Two recent highlights included the address Dr. Nugent gave at the House of Lords in May, on the occasion of the 20th anniversary of the UK Brazelton Centre, and his address to the Irish Parliament (Houses of the Oireachtas), the Joint Committee on Health and Children, at Leinster House, Dublin in November 2015. The main thrust of the address to the Senators and House Members was that was the first three years of life are a time of massive brain development, with lifelong implications for future mental health. Policies that support families are critical as the strength and quality of the relationship between parents and family and their children are fundamental to the effective development of children’s brain’s functions and capacity. (For the Minutes of the Committee hearings click here: Child and Infant Mental Health:…: 12 Nov 2015: Oireachtas Joint and Select Committees (KildareStre). On his visit to Ireland, Dr. Nugent was also awarded the 2015 Psychological Society of Ireland Presidential Citation by Dr. Paul D’Alton, President of the Psychological Society of Ireland. The citation read: “In recognition and deep appreciation for your significant contribution to infant mental health and the resulting betterment of the human project”. Reception at Harvard Faculty Club for NBO and NBAS Trainers with special guests T. Berry Brazelton, Jean Cole, Joanna Hawthorne and Joao Gomes Pedro. In the International section, read about the NBO and NBAS International Meeting which drew NBO and NBAS trainers from over twenty countries and which took place at Harvard from Nov. 2nd – 4th., 2015 and read about the first NBO training programs that were conducted in Shanghai, Hong Kong, Japan, Norway, Switzerland, China (Xi’an), Brazil and Africa and trainings conducted across the USA and the UK and in Australia, Iceland, Denmark and Norway. Dr. Nugent conducted an Introduction to the NBO in a workshop presented by the Irish Infant Mental Health Association and the Irish Psychological Society in Dublin on November 16th, 2015. In the Research and Training section you can read about Dr. Nugent’s recent visits to the Shanghai, Hong Kong, Tokyo and Nagoya for NBO training, also to the Czech Republic, Ireland, Switzerland, Italy, China, Norway, Portugal and Australia. He presented the Keynote Address at the Finland Association for Infant Mental Health in Helsinki on May 10th, 2017. He also gave the Open Lecture at the University of Nagoya, Japan in September 2016. He was also invited to present a Master Lecture at the 15th World Congress for the World Association for Infant Mental Health in Prague on June 1st. 2016. He was also the Keynote Speaker at the 25th Nordic Infant Mental Health (NFSU) Jubilee Conference in Oslo, Norway on March 10th, 2016. Unni Tranaas Vannebo, NAIMH President and NBO Trainer introduced the conference. The title of his talk was: Beginning in the Perinatal Period – a unique opportunity for preventive intervention and support for parents. Participants came from all over Norway, Denmark, Iceland, Sweden and Finland. Other speakers included Professor Emeritus Lars Smith, Sari Ahlqvist-Björkroth and Mette Sund Sjøvold. Professor Nugent was also the keynote speaker at Irish Psychological Society Meeting at Galway in November, 2015 and was the keynote speaker at the International conference entitled, “Mi fido di te – I TRUST YOU! ” – A tribute to T. Berry Brazelton, which was held in Rome on March 13-14th, 2015. He was also the keynote speaker at the NCAST 15th Biennial NCAST Programs Institute in Seattle in Washington in June 2014 and also keynote speaker at the Montclair State University TODD OUIDA CHILDREN’S FOUNDATION CONFERENCE in May of the same year. He also spoke at the BIDIP conference, “Beyond the NICU: Addressing the Emotional and Developmental Health of NICU Graduates and their Families” on Sat. Nov. 22nd, 2014 at the Massachusetts School of Professional Psychology. In the International Section, the recent NBO trainings at Ubulele in Johannesburg, South Africa, Belo Horizonte in Brazil are also featured and read about the Conference in honor of Berry Brazelton organized by Professor Gherardo Rapisardi in Rome in March and about the recently completed Brazelton Centre UK NBO Trainers meeting held at the Møller Centre, Churchill College, at the University of Cambridge, England. You can find out about the NBO Training which took place in Xi’an in China, as well as the eminently successful NBO/NBAS meetings that took place at Edinburgh University on June 12-13th 2014, at the time of the 14th WAIMH (World Association for Infant Mental Health) conference. Drs. Kevin Nugent and Joanna Hawthorne coordinated and hosted the meetings on both days. The meeting was attended by the 96-year-old Dr. Berry Brazelton and by NBO and NBAS trainers and trainees from around the world who gathered to share their experiences and their ideas with colleagues. (Here is a short video clip of his words of thanks at the Traditional music evening in Edinburgh). Professor Colwyn Trevarthen’s engrossing and elegantly presented keynote address “What infants (and my colleagues) teach us about being human; how to share their conviviality and care for them” set the tone for the program of lectures that followed. Click here to view the June 13th programme: Understanding the baby and supporting parents using the NBO and NBAS: International perspectives and click on the photo gallery on the right to get a flavor of the atmosphere at the Edinburgh meeting. In this section, you can also read about recent NBO training conducted in Reykjavik, Iceland, by Drs. Lise Johnson and Yvette Blanchard on Sept 18-19th., 2014. NBO training was also conducted in Thisted in North Jutland, Denmark in October by NBO Trainers Jeanette Appleton and Inge Nickell (UK). (NBO group photo on left with convener and organizer, Merethe Vinter). New NBO trainees in Lillehammer, Norway. Nov 2014. 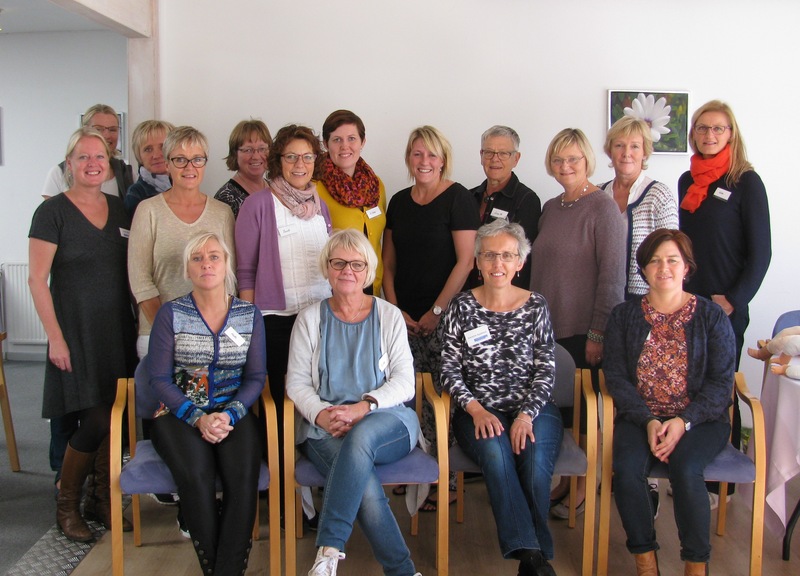 Read about NBO training conducted in Lillehammer, Norway, by Kari Slinning and Nancy Moss (on the left, see NBO group photo with Nancy Moss and Kari Slinning). Read also about Dr. Nugent’s visit to Melbourne to establish a new NBO Training Center, where he also presented Grand Rounds at the Royal Women’s Hospital in Melbourne and at the Royal Children’s Hospital in Melbourne. Click here for information on Australia NBO training. Read also about NBO training in Australia. On the left is a photo of Drs. Campbell Paul and Susan Nicolson with the NBO trainees in Shapparton, Central Victoria. 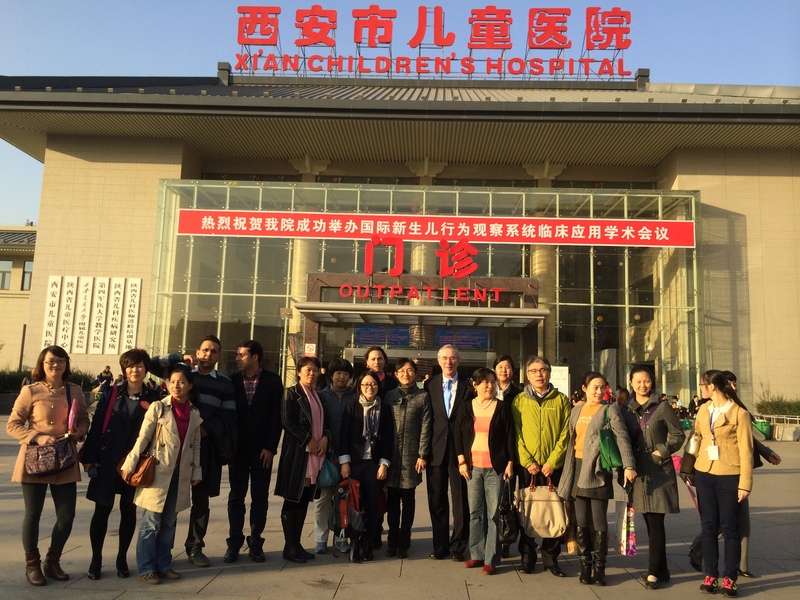 NBO conference, Xi’an Children’s Hospital. Here on the left, is the photo of the Xi’an NBO Conference Speakers and the NBO trainers and trainees on the occasion of the welcome ceremony at Xi’an Children’s Hospital. Included are Drs. Susan Nicoloson (Australia), Chuen Wai Lee (UK), Hui Li (China), Shohei Ohgi (Japan) and Kevin Nugent. Mr. Anmao Li, Dean, Mr. Lei Wang, Mr. Lu Wang represented the Xi’an Children’s Hospital. Click here to view brief video: NBO and NBAS in Xi’an. 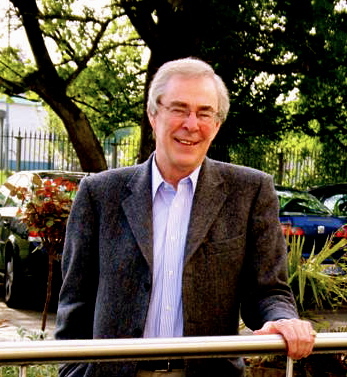 Professor Nugent speaks in the Irish Parliament – Oireachtas. Professor Kevin Nugent was invited to speak before the Joint Committee on Health and Children, Houses of the Oireachtas, Leinster House, Dublin, on November 12, 2015. He was joined by Dr. Paul D’Alton, President of the Irish Psychological Society. The title of his talk was: The first three years of life are a time of massive brain development, with lifelong implications for the child and society. The main theme of the presentation to the Committee was that the foundations of sound mental health are built early in life, so that early experiences—including children’s relationships with parents, caregivers, relatives, teachers, and peers—interact with genes to shape the architecture of the human brain. Neuroscience has highlighted the fundamental importance of early experiences on the developing brain and the associated risks of poor-quality experiences and environments during the first three years. 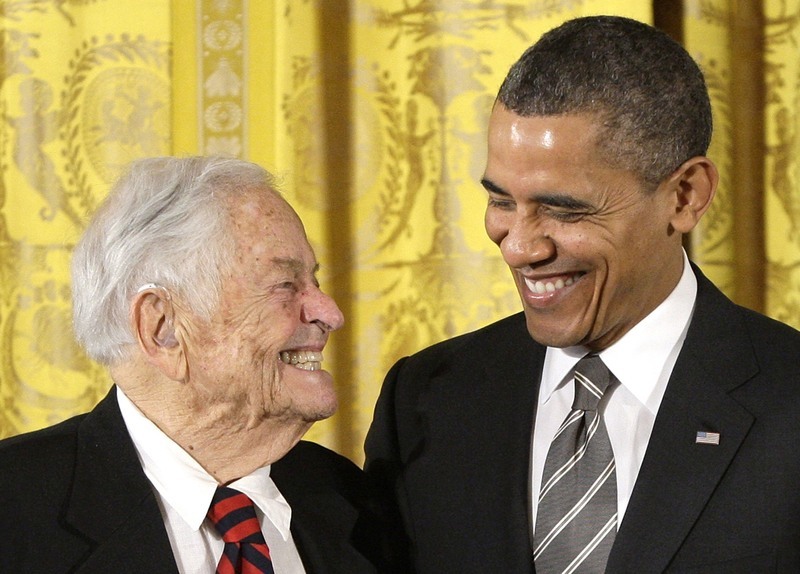 In the photo on the left, Dr. Brazelton smiles as he receives the Citizens Medal from President Obama at the White House. See the Media section for more. “It is my distinguished honor to award these individuals the 2012 Citizens Medal for their commitment to public service. Their selflessness and courage inspire us all to look for opportunities to better serve our communities and our country.” Says Dr. Brazelton, “I may be 94 years old, but I’m not done. We must all speak up for the children we care for who so often are unable to speak for themselves”. Watch the White House presentation here. In the International and Research sections, read tributes from around the world to our dear friend and colleague, the late Professor Daniel Stern, which appeared in Perspectives in Infant Mental Health, the newsletter of the World Association for Infant Mental Health. Professors Nugent, Brazelton, Gomes-Pedro and Tronick celebrating Dr. Brazelton’s 95th birthday at the Lisboa conference. Over 1000 people attend the International Conference “Valuing Baby and Family Passion – Towards a Science of Happiness” at the Calouste Gulbenkian, Lisbon. The Conference was hosted by Professor Joao Gomes-Pedro and the Fundacao Brazelton/Gomes Pedro. Among the speakers were Joao Gomes-Pedro, Berry Brazelton, Joshua Sparrow, Barry Lester, Ed Tronick, Marilyn Davillier, Stefan Klein and Kevin Nugent. Click here to read Kevin Nugent’s presentation in full: The Newborn Period – where hope and happiness meet. All these presentations are included in a new book, “Valuing Baby and Family Passion – Towards a Science of Happiness”, which has just been published – see the Books section. Finally, read Nathaniel Reade’s article, Speaking Newborn, in the For Parents section. “Babies may not come with instruction manuals, but you can learn a lot just by watching them…….”, he writes. Dr. Nugent: thank you for your life-long work. I am wondering if you have every thought about how your work might dove-tail with part of Catholic Theology–specifically the Theology surrounding the Virgin Mary and the Annunciation–how the relationships between God, the Father and the Holy Spirit and the conception of the Christ child at the Annunciation–encapsulated in the Hail Mary prayer–can be a spiritual/meditative way of accessing or practicing many of the important findings of your life-long research to strengthen and enrich the parent child bond? — I work in Mental Health in Los Angeles, CA, and we have a infant and young mothers mental health program at our clinic which is supervised by one of our staff who is currently a fellow in the Napa Institute in California. This fellow–Rocio Luevano–told us about you, the NBO and your work with Dr. Brazelton. 4701 E. Cesar E. Chavez Ave.
Kari Slinning and Unni Tranaas Vannebo and new NBO trainers Nina Cheetham Bøhle (on the left) and Hege Sandtrø (on the right). (r. to l.) Professor Gomes-Pedro, former President of Portugal. Jorge Sampaio, Artur Santos Silva, President of Gulbenkian. Trainers Kari Slinning and Kevin Nugent with Natascha Hämmerli-Schutz and Eva Cignacco-Müller and the NBO Bern group. Dr. Paul D’Alton presents Professor Nugent with the 2015 Presidential citation. 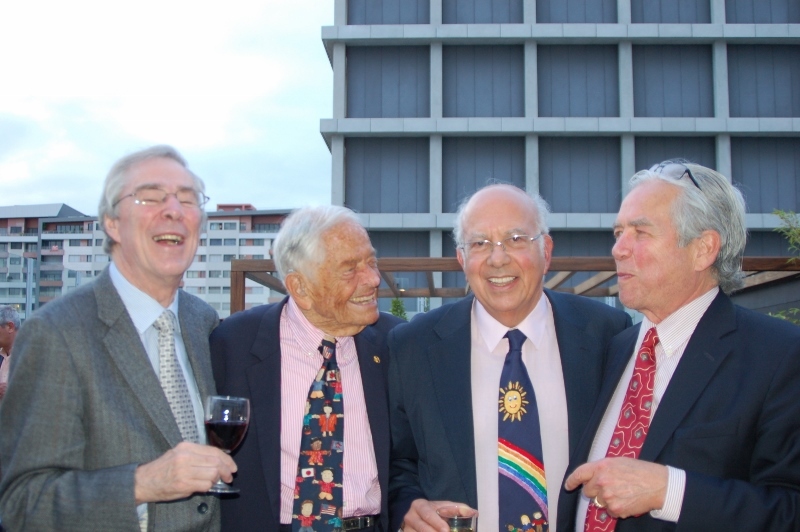 From left: Kevin Nugent, Leonard Rappaport, Jerome Kagan, Heidelise Als, Jack Shonkoff and Berry Brazelton. Reception at Harvard Faculty Club for NBO and NBAS Trainers with special guests T. Berry Brazelton and Jean Cole. Mi Fido Di Te audience, Rome, 2015. Conference speakers from left: J. Kevin Nugent, Hui Li, Susan Nicolson, Chuen Wai Lee, Shohei Ohgi. New NBO trainees in Lillehammer, Norway with Kari Slinning and Nancy Moss. NBAS Symposium Dublin Castle, 1982 – Kevin, Grette Myrdal, Connie Keefer, Hanne Munck, Kate Buttenweiser and piper. As part of The Human Development Strategic Initiative, over thirty practitioners participated in NBO training at the Austen Riggs Center on April 8th and 9th, 2017. J. Kevin Nugent joined Riggs’ staff member, Claudia Gold, in providing the NBO training. Pediatricians, nurses and midwives - predominantly from Shanghai but from other parts of China also - attended the training at Pudong Health Care Hospital for Women and Children. While 18 trainees participated in the NBO session, five trainees took part in the NBAS session. NBO training, hosted by Joyce MOK and the Hong Kong Association for Infant Mental Health was presented in Hong Kong in September, 2016. NBO training was also conducted in Tokyo and Nagoya. Two new NBO trainers Mariko Iwayama and Eiko Saito were installed as NBO trainers. In all three settings, Campbell Paul and Kevin Nugent were the trainers. Professor Shohei Ohgi, the Director of NBAS and NBO training in Japan hosted the NBO training. Dr. Nugent delivered a Master Lecture at the World Association for Infant Mental Health Congress, Prague on June 1st, 2016. Dr. Kevin Nugent gave the keynote address at the 25th annual NFSU meeting in Olso, March 10th, 2016. The Fundaçâo Brazelton/GomesPedro presented a conference, Love Synapses: Building Strong Children, Families and Communities, in Lisbon. Speakers included: Ana Teresa Brito, Joao Gomes Pedro, Maria do Céu Machado, Charles Nelson, Kevin Nugent, Emilio Salgueiro, Adriana Sampaio, Danile Sampaio, Jorge Sampaio, Isabel Soares, Joshua Sparrow. Drs. Nugent and Slinning presented NBO training at the Univeristy of Bern on Nov 19-20th. The training included nurses, psychologists, psychiatrists, physiotherapists and infant specialists from all over Switzerland and was organized by Professor Eva Cignacco Mülller and Natascha Schütz Hämmerli. Professor Nugent gave the keynote address at Psychological Society of Ireland Annual Meeting in Galway, November 13th, 2013. He also presented a workshop on the NBO to members of the Irish Infant Mental Health Association and the Psychology Society of Ireland in Dublin on November 16th, 2015. Professor Nugent was awarded the 2015 Presidential Citation from the Psychological Society of Ireland by Dr. Paul D’Alton, President of the PSI. The citation read: “In recognition and deep appreciation for your significant contribution to infant mental health and the resulting betterment of the human project”. The International NBO and NBAS Trainers Meeting took place at Harvard Medical School from Nov 2-4, 2015. NBAS and NBO trainers from 21 countries participated. Guest speakers include Professors Heidelise Als, Terrie Inder, Jerome Kagan, Charles Nelson, Leonard Rapaport and Jack Shonkoff. Berry Brazelton also participated (see photo gallery). 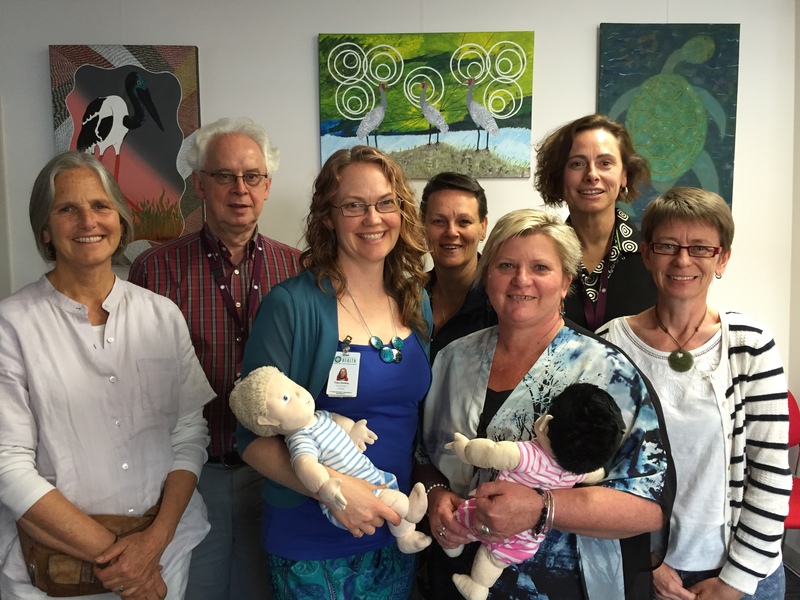 Dr. Susan Nicolson conducted NBO training with Aboriginal workers in Northern Victoria, Australia. Dr. Constance Keefer and Dr. Yvette Blanchard conducted NBO training with the Salish & Kootenai tribes in Montana in the United States. NBO training also took place in Boston, Chicago and Madison, Wisconsin in Fall 2015. The first NBO training to take place in Africa, took place at the Ububele Parent Infant Programme in Johannesburg, South Africa, on May 11-12th, 2015. Ububele is an educational and psychotherapy trust providing training and services to improve the emotional development of children under 7 years. Dr. Jessica Dym-Bartlett and J. Kevin Nugent presented: A Randomized Study of the Effects of a Short-Term Strengths-Based Newborn Intervention on Mother-Infant Interaction at the SRCD meeting in Philadelphia. “Rome Conference: Mi fido di te – I TRUST YOU! ” – A tribute to T. Berry Brazelton. An international conference presented by Professor Gherardo Rapisardi, NBAS trainer for Italy, took place in Rome on March 13-14th, 2015. The conference was attended by 700-800 professionals from all over Italy. The title was: “Mi fido di te – I TRUST YOU! ” – A tribute to T. Berry Brazelton. See International section for details. The Møller Centre, Churchill College at the University of Cambridge was the setting for a special meeting of UK NBO trainers which took place on 29th – 31st January, 2015. See international Section. NBO Training for the new UC Davis Infant-Parent Mental Health Fellowship program, under Dr. Kristi Brandt's direction, took place on March 29th at Napa. Drs. Keefer and Nugent presented the training, which was attended by a range of professionals from across California and other parts of the country. The first NBO Training to take place in Brazil was presented at the Department of Pediatrics, Universidade Federal de Minas Gerais, Belo Horizonte on March 27-28th, 2015. It was an extremely successful learning experience for participants. The trainers were Drs. Lise Johnson and Beth McManus, while the facilitators were Prof. Claudia Regina Lindgren Alves, MD, PhD and Profa. Titular Lívia C.Magalhães. NBO Training in Thisted, North Jutland, Denmark. 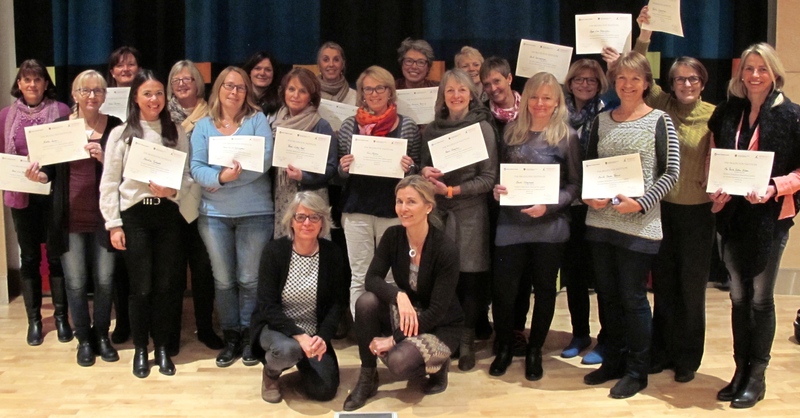 The first NBO training program in Denmark was conducted in Thisted in North Jutland by NBO Trainers Jeanette Appleton and Inge Nickell (UK) on October 1st-2nd., 2014. The training was convened by Merethe Vinter. Twenty-five NBO trainees received their certificates from NBO Trainers Drs. Kari Slinning and Nancy Moss at a meeting in Lillehammer in November, 2014.